It’s hard to believe that just a week ago we were cross country skiing. 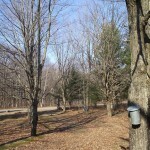 Now, all the snow is melted, and we’re wondering how St. Joseph Island’s maple syrup producers will fare during this unusually warm March and maple syrup season. 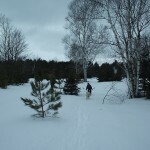 From Cross Country Skiing . . .
to tapping maples . . . in less than a week!